Can I leave my umbrella out all the time? All umbrellas should be lowered in windy conditions. Operator’s discretion is advised to prevent direct and consequential damage from the wind. Will this item look exactly like the one that's pictured? This item is either made of wood or designed to mimic the look of natural wood. Because of the natural differences in wood, no two items will look exactly the same. Each item is designed from, or to look like, the same type of wood, but each will have its own unique appearance and wood-grain. 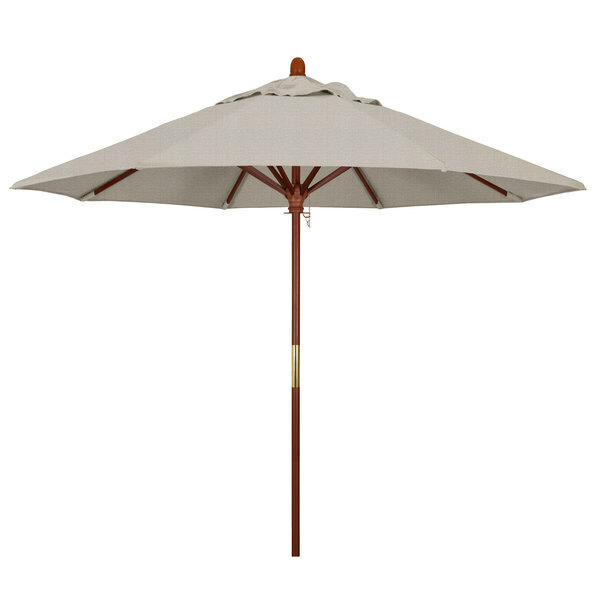 Keep your decks, outdoor dining areas, or pool-side patios shaded with this California Umbrella MARE 908 OLEFIN Grove 9' round push lift umbrella with 1 1/2" hardwood pole. With a classic design and warm, natural coloring, the Grove series offers umbrellas that are both visually-appealing and sturdy. This umbrella features a 1 1/2" thick hardwood pole with sleek, stainless steel hardware for a robust foundation. Its durable hardwood ribs provide excellent support for the canopy and boasts earthy tones that blend in perfectly with outdoor settings. In addition, the single wind vent allows for sufficient air flow to ensure stability and prevent the umbrella from moving with strong wind gusts. This umbrella's size has sufficient area coverage, providing multiple guests with relief from the sun's rays. Its push lift also allows staff members to easily open or close the umbrella with a simple push. In comparison to pulley lifts, this style of lift helps keep the canopy undisturbed in high-traffic areas since it eliminates any hanging rope that could encourage tampering. The canopy's fabric is made with durable, synthetic Olefin fibers that offer better fade resistance than polyester and cotton counterparts without the added expense that comes with acrylic canvases. It's an excellent choice for budget-conscious consumers, and is sure to provide a professional look for years to come. Producing high-quality outdoor products since 1946, California Umbrella is devoted to creating cool, comfortable shade wherever you see fit. Their collection provides an ample range of material and fabric options, as well as attractive styles to meet the demands of the ever-changing market. From simple to high-end umbrellas with a variety of outdoor accessories, California Umbrella has the shade solution for you and your facility! Height (to bottom of ribs): 77"